SENSY has provided a complete solution to a specific need for force measurement required by a manufacturer of quick-release mooring hooks. The customer requested a method to measure the forces exerted by a ship’s cable on mooring hooks in order to display them and, if necessary, to disengage the ship if the forces exceed the acceptable limit. 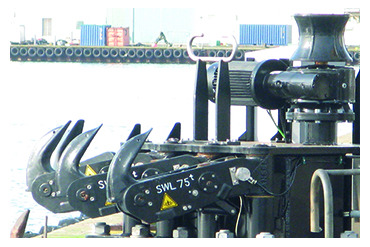 Custom-made load pin is used to replace existing axle on the hook. Each load pin is provided with an 4-20 mA output signal. All these outputs are connected to a PLC located in safe zone. Dedicated software is used to display the six forces as six bar graphs. Depending on the evolution of the tensile stresses, the bars change colour from green to red and the system sounds an adjustable audible alert. ATEX certification for operating in a potentially explosive environment. This application example shows what SENSY can offer as custom-built solutions in the force-measurement field in a marine environment and how SENSY is able to meet the specific needs of this market.